I hope you are having an enjoyable Saturday morning. Today in Northern NJ it started out hazy and the sun is starting to show itself slowly as I am typing this post. The electrician finally came to her home and installed them. She is very happy with the elegance they add to her home. Those are so pretty! Love the finish! Thanks so much Karianne. I will be doing many for our new home!! I love them, a slight addiction, LOL!!! Cynthia, these are so pretty! 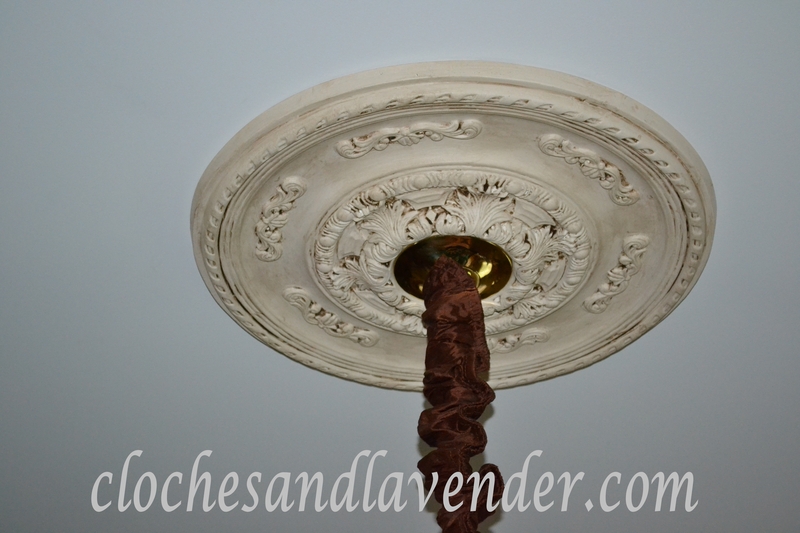 I love the elegance these added to the ceilings! You did a fabulous job on finishing them. I also love the chain covers! Have a fabulous weekend! Thanks so much Betsy. I will be doing some for our new home too when we get to that point. The medallions you made are beautiful, Cynthia. They really dress up the ceiling nicely around the chandeliers. Thanks Mary Alice, I just love them in a home. I will have them everywhere in the new house where there is a chandelier. I can’t help it. She truly is very happy with them! Beautiful, Cynthia! The medallions add such pretty architectural interest to the ceiling. Sherry thanks so much for your kind words! I love the detail the medallions add to a room. You are very talented and I love how they look in her home. Enjoy the rest of the weekend………. Emily, thanks so much for the visit and I am going to make more for our new home too, eventually! Wow are those fabulous! Thanks for the link to to tutorial!! Will you make some for your new house? Oh yes, I will be making them for our new house when we get to that point. Will be a while but I am absolutely going to make them and will post about it! They really do add a lot. Love them all! The medallion is so lovely! I’ve been wanting one for years…I should just do it. You should do it, it really adds so much. I am planning on making them for our new home once it is finished! Reblogged this on Uniquely Yours… or Mine!. I LOVE the medallions! My friend recently bought a house that has them and they add the perfect classic touch to the room! I am going to make some for our new home when we get to that point. I made them for our old home too. Beautiful! Love the color so much! Thanks so much Stacy! How are things?? 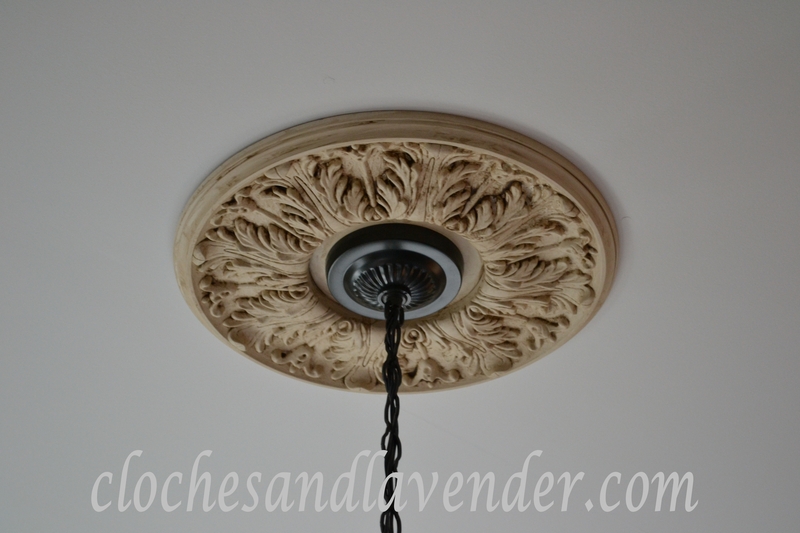 I have never had a ceiling medallion but they are really beautiful! The cord covers too! I just love them and use them all the time. When you make them yourself they are not really expensive to buy them finished $100’s, nuts! I will making them for the new house too! Can’t wait to get to all those points of decorating and choosing. Stay tuned Carlene. I finally decorated my friends home for the fall using her stuff so I will be posting that too. Hi, Cynthia! These are gorgeous! 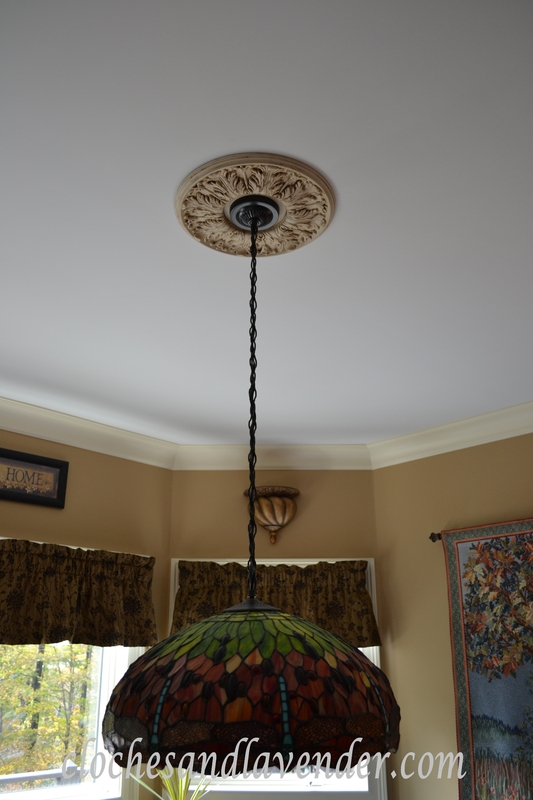 You did a great job and I’m sure your friend just loves her new ceiling bling! They look great! Thanks so much Sonya. She just loves them! Whoever invented ceiling medallions is a genius! They offer a lot of bang for the buck that’s for sure. Love the aged finish you used Cynthia :). Your friend is a lucky gal! I just love them. I use them with all our chandeliers. I will be making them for the new house. Thank you for your visit to my blog. I hope you will visit often. I follow your blog and I hope you will follow back. She is very happy she has wanted them for a while so she asked me to do them for her. Oh wow, they look beautiful! Thanks so much!! I hope you will follow Cloches and Lavender!! Cynthia, Your medallions turned out so beautiful! I’m sure your friend is so happy with them up now. She loves them and I am a huge fan of them. I will be making some for the new house when we get to that point. 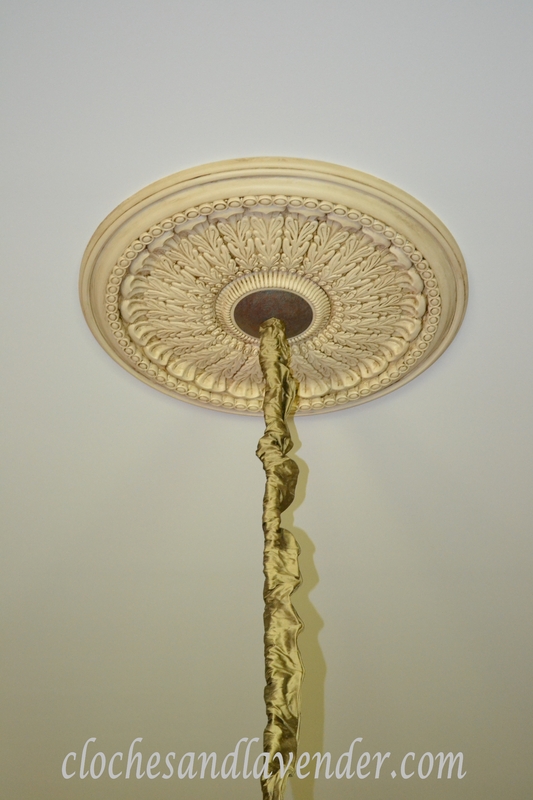 These medallions really add some class to the ceiling! I love how detailed they are! I really like ceiling medallions. 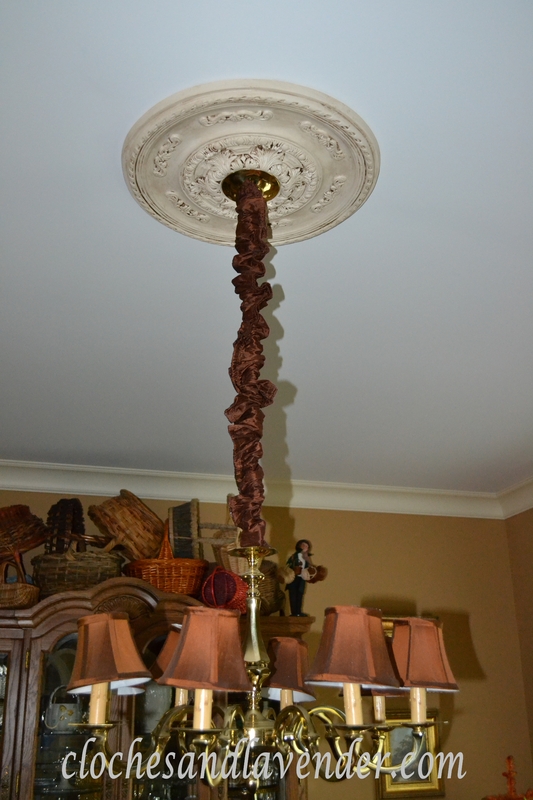 They add such a nice finishing touch to a chandelier. I bet she is happy to have them installed now. She is so happy it took forever for the man to come and do them. He really came because her foyer ceiling is so high I wouldn’t let my husband do it so he said he would do them all. Can’t wait to make them for our new home. Thanks for always following! Cynthia..they are beautiful!! !…Mine needs a definite “re-do”…so where do you get those beauties to make even more beautiful … Lowes does not have much of a selection…. It is funny that you said that because these are from our Lowes. Sometimes I get them from the internet too. I am going to do that for our new house. They are so worth doing them yourself. Unfinished from this internet site I found, which I can’t remember the name of right now, they have a huge selection. I can’t wait! The medallions add such a beautiful touch! I’m also glad to see the progress on your new home. Exciting times! So nice that you stopped by. I visit every time post, I look forward to it. Thanks so much for the visit and your kind words! Thanks Susan. I can’t wait to make them for our new house! Medallions do add such a nice touch to a room. A simple way to decorate the ceiling! Oooh…I saw the big dig! Congrats on breaking ground. Hope the build goes smoothly. Happy Weekend! Oh Donna thanks so much they are pouring the foundation on Tuesday. We met with the builder today. I didn’t think you followed my blog and I am glad that you do!! LOL! Had I known I would have asked you to do mine! Just beautiful! I love ceiling medallions. They really dress up a room! I would have done it for you Manuela, LOL. I am going to make them for our new home when we get to that point. 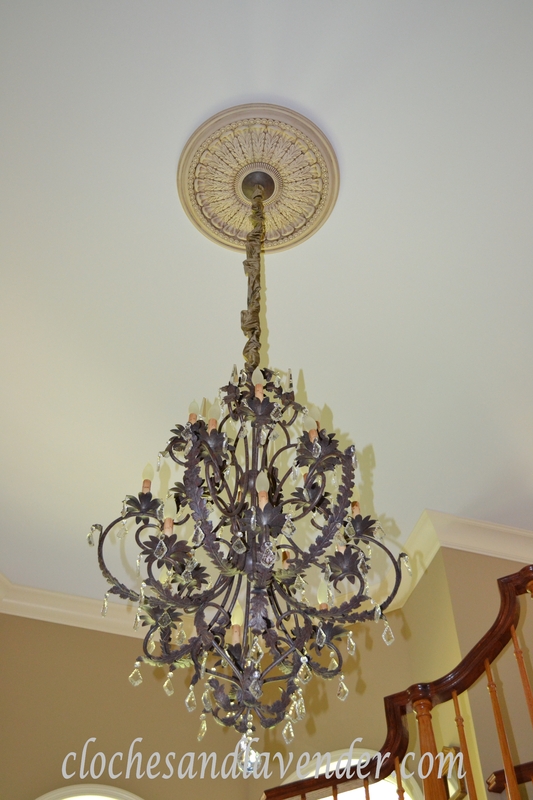 Ceiling medallions really add a lot of character to a room, don’t they? I’m going to have to figure out where I can put one! They really do I had them in my home and when we finish building our new home I am going to make a bunch! Really pretty! I used to have one in my old house and kind of miss it now! I had to leave all of our in the house. I am going to make some for the new house when we get to that point!